Inexpensive bulk radio pedometers or pedometer radios, custom imprinted with your logo or message. We also supply wholesale blank (not imprinted) radio pedometers for $3.75 each. Budget Prices in the USA and Canada for wholesale custom imprinted pedometers with radio . American clients pay no taxes. We will send you a proof for your approval before production. Prices include a 1 color, 1 location screen imprint. Assortment of pedometer colors is allowed. If you require additional colors or imprint locations, then you have to add $0.40 per color, per imprint location, per unit, plus an additional Setup Charge. Typical Production Time: 7-10days after artwork approval; 3 day rush production is available: contact us. The wholesale custom imprinted pedometer radio has a sturdy and compact construction. 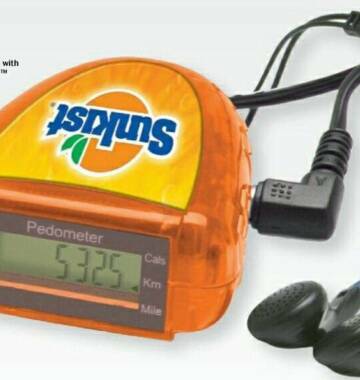 The radio pedometer comes with a mini radio and a step, mileage and calorie counting pedometer. The mini radio comes with FM auto scan, earphone and 2 AAA batteries, packed separately. Imprint Area: 7/8" x 7/8"
Colors: Translucent Red, Blue, Orange and Purple. Typical Production Time: 9 days after artwork approval; 3 day rush production is available: contact us.